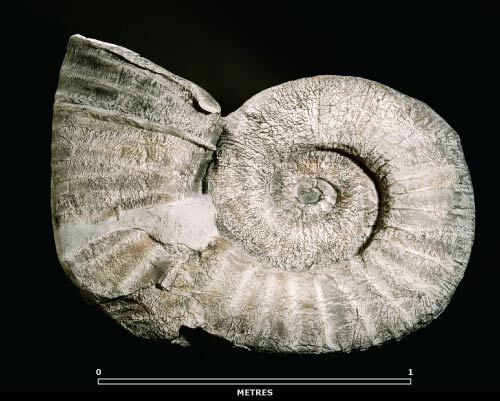 This giant ammonite, Lytoceras taharoaense, is 1.42 metres in diameter and weighs 1,200 kilograms. It was discovered in February 1977 by Jean Gyles of Wellington at Taharoa, 10 kilometres south of Kāwhia Harbour on the Waikato Coast, in a small roadside slip. Excavation took several attempts, with the final chunk recovered in April 1978. It is late Jurassic in age (around 140 million years ago). This fossil is part of the GNS Science National Paleontological Collection and is on display at the Museum of New Zealand Te Papa Tongarewa.